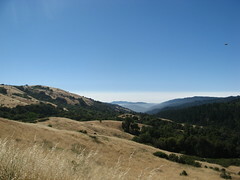 If you’ve got a mind to do one crazy thing this summer, try hiking in the hot sun at Monte Bello Open Space Preserve. Driving directions: From Interstate 280, take Page Mill Road west for seven miles; from Skyline Boulevard (Highway 35), take Page Mill east for 1.5 miles. The park in the Santa Cruz Mountains west of Los Altos Hills is vista-rich in all seasons, but it has a certain visual splendor in early summer — when the green forests provide an excellent contrast to the golden hills — that tempts a hiker to venture out on warm days more wisely spent in a cool redwood forest. Intrepid hikers make their way to the 2,800-foot Black Mountain summit, where the panorama takes in San Francisco, Silicon Valley, the Pacific Ocean and Mount Diablo on clear days. Families with small children and folks with heat sensitivities can try a more relaxed stroll through the wooded Stevens Creek Nature Trail. There’s no bad time to hike Monte Bello — the views are strikingly clear after fall and winter rains, and wildflowers decorate the hills in spring. Summer brings more sweat and struggle, but it’s worth the trouble. Standard precautions: Dress for heat, and slather on the sunscreen. Double your usual water supply if you’re going more than a mile or two in the sun. Poison oak is common in the wooded areas. Don’t leave valuables in your car – the lot is often prowled by smash-and-grabbers. Moderate: Add three miles — and about 1,200 feet of elevation gain — to the Stevens Creek trail hike by taking Bella Vista Trail to Montebello Road to Black Mountain Summit and returning via Indian Creek and Canyon trails. This jaunt has some of the best vistas in the Santa Cruz Mountains, but it’s very warm in the summer. Hard: Grab a map at the trail head, and chart a grand loop through nearby open space preserves. My favorite 12-miler goes west to Skyline Ridge and south through Long Ridge, crosses Highway 35 at the Grizzly Flat Trail, descends into Upper Stevens Creek County Park and returns on the Canyon Trail. Midpeninsula Open Space District page.